A settlement named Bardoujev situated on the country road from Old Hungary to Poland is mentioned in the Ipatievsky Annals as early as in 1241, and when King Charles Robert granted town privileges to German ‘guests’ here in 1320 they settled close to the older Slovak settlement. Apart from agriculture, crafts and trade were the main activities of the population of Bardejov during this period. Extensive exemptions from taxes and fees, and later the right to hold an annual fair on St Egidius’ Day (1 September) contributed to the prosperity of the town over the following years. When Bardejov gained the status of the free royal town in 1376, the rows of buildings enclosing the rectangular square were already fortified. The Roman Catholic St Egidius Parish Church, dating from the early 14th century, closed the northern part of the square. In the first half of the 15th century it was rebuilt into a three-nave basilica. Despite Gothic modifications to its exterior after a fire in 1878, unique interior furnishings have been preserved in the church. The most remarkable part consists of the collection of 11 late Gothic winged altars, patron´s pews and a stone pastophorium dating from 1465. 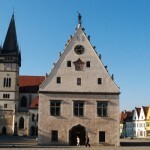 A dominant feature of the square is the symbol of secular power – the late Gothic Town Hall which was built at the beginning of the 16th century. With its Renaissance portals and an oriel on its west side it is considered to have been the first Renaissance building in Slovakia. Today, the interior contains the most valuable exhibits of the Šariš Museum. 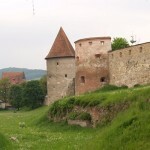 Bardejov’s system of town walls deserves special attention. As one of the most perfect Gothic town fortifications in Slovakia built since the 14th century it became the significant part of both European and world cultural heritage also due to its level of preservation. A walled walkway was added in the second phase of modernisation that took place in the first decades of the 15th century, as well as an outer moat wall and stone fore gates with drawbridges on the outer side. The majority of bastions originated in the 15th and early 16th centuries. The third stage of works, brought about by the imminent Ottoman threat, resulted in the construction of barbicans. The 15th and early 16th centuries were a period of economic boom connected with the development of crafts, especially with the production and sale of canvas and other trades in the town. All of Bardejov’s burgher houses were founded during this period. About 500 houses were built in the first half of the 15th century. These houses were characterised by high gable roofs and originally Gothic mázhaus and, later on, by a two wing layout with a passage. Later Renaissance or Baroque modifications of houses were usually made after fires or in response to a need for more living space at the expense of economic functions. 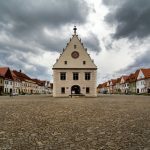 Bardejov´s burgher houses represent a developed burgher culture created by a multi-ethnic and multi-cultural society. This fact is one of the reasons for the successful establishment of the ideas of humanism in this part of Old Hungary. 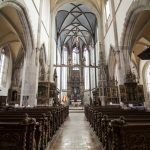 It is connected with the activity of two famous personalities – a pundit and poet Valentin Ecchius and a theologian and writer Leonard Stockel – who taught at the town’s humanistic school, where the first school rules in Old Hungary were introduced. 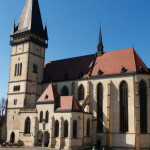 Bardejov also played an important role in the consolidation of Hungarian Protestantism. It was here that L Stockel compiled Confesion Pentapolitana as the common document of the five Eastern Slovakia towns that became a model for contemporary Protestant religions. In the neighbourhood of the town centre, surrounded by modern buildings from the period of the last 40 years, may be found a town-planning rarity of the region – the only partially-preserved former Jewish bath and synagogue complex, the remnant of a suburban centre from the end of the 18th century, built according to plans and Talmud rules. This integrated area is bound to Bardejov’s now extinct Jewish community and represents the religious, social and economic life of the Jewish community that was formed an important part of the town´s life from the end of the 18th century down to the Second World War. The big synagogue dominates over the complex as well as the ritual mikvah bath and beth hamidrash – the assembly building. The medieval town of Bardejov narrowly avoided severe large-scale demolitions. The Town Conservation Reservation was declared in 1950 and since 2000 it has been entered on the list of UNESCO World Heritage Sites in Slovakia.